Is it too cliché to start this with a contemplative statement like “I can’t believe we’ve already been cruising for a year” or “This year has really flown by” or maybe “can you believe our boat’s still floating after a whole year”? It’s hard not to because that’s precisely how I feel. I distinctly remember slicing through our sacrificial dockline with a machete at Shilshole Marina and hopping aboard with a last wave to our friends gathered on the dock. That could not possibly have been 12 months ago. On the other hand, we’ve experienced a lifetime’s worth in this one short year (still too cliché?). We have sailed with whales and snorkeled with sea lions. We have varnished teak and changed fuel filters. We have ripped sails and chafed through lines. We have motored too many miles and ate too many tacos. We have made bonfires and lit fireworks. We have surfed down swell and bashed through chop. We have cried in frustration and cried in laughter. We have missed friends and family and found a new community. Since I machete-d through our dock lines 12 months ago, we have traveled 4,636 nautical miles on Halcyon, which took us about 923 hours, including all the stops to put up sails, fix the engine, swim with sea turtles and cool off in the deep blue water. This comes out to an average speed of just over 5 knots. And here’s the embarrassing truth. Of those 923 hours of travel, we sailed only 397 of them, or 43%. This is an awkward statistic for me. We live and cruise on a SAILboat so that we can SAIL, not motor for days on end. I could easily justify this lopsided fraction with intelligent-sounding comments like “Southern Mexico is known for flukey winds, it’s common that cruisers motor through this stretch” or “when bad weather is coming in behind you, the safest decision is to fire up the motor and get to protection quickly”. But the reality is much simpler than that: it turns out we are destination cruisers. There are the cruisers that love to be at sea, to be untethered from land and bobbing in the ocean regardless of (or maybe due to) the storms, the swell, the heat, the rain, the lightening, the sleep deprivation and the tight quarters. And then there are those that accept the passages as a means to get to the destinations. That’s us. Not to say passages can’t be wonderful joyful experiences, sometimes they truly are. It’s just that we’d rather be anchored, free to roam and jump in and socialize and sleep through the night. Which means if our speed drops and sails flog, we are quicker than the “passage cruisers” to furl sails and crank up the motor. We want to get there. This destination attitude may certainly shift over time, though we’ve met plenty of tenured cruisers who, after 4 or 8 or 11 years of cruising, are still out here enduring the passages to reach the destinations. There is not one approach that’s better than the other, provided the passage cruisers don’t mind when a 2-day passage takes 4 days and the destination cruisers are willing to pony up to replace the burned diesel. Which is what we have done, sloshing through nearly 450 gallons of diesel in the last 12 months. So on to the destinations. 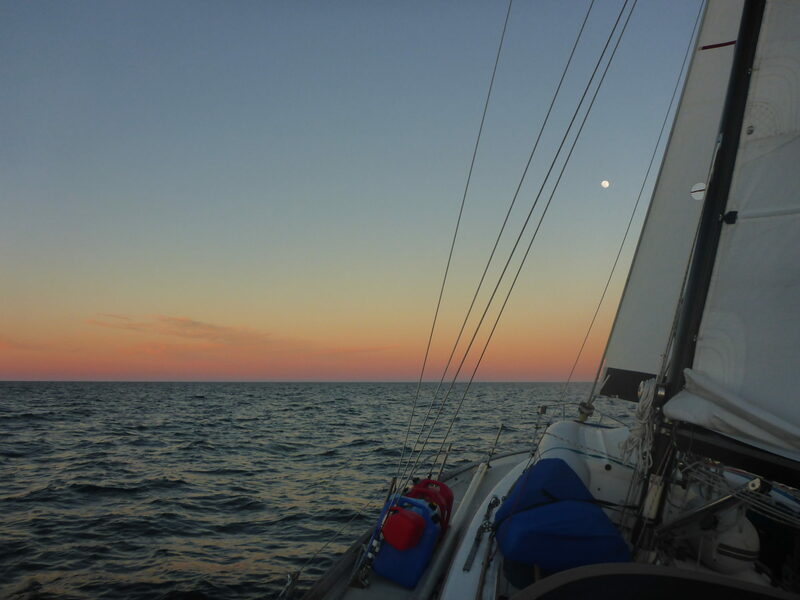 In the last year, Halcyon has spent the night in 76 different (stationary) places, including 16 marinas, 59 anchorages and one mooring ball (on our very first night, spent serenely with friends at the north end of Bainbridge Island). We prefer anchoring to being in a marina, but are not averse to the occasional splurge for a fresh water wash-down (us and the boat), unlimited electricity, and a dependably dry landing. In the last year, we have spent 182 nights at anchor and 85 nights in a marina (this does not include the last 2.5 months when Halcyon has been in the marina and then on the hard at Puerto Chiapas for the off season). This seems like a happy medium to me; we have cruised with boats hosting an anchor that has never seen a muddy bottom, and boats that haven’t touched a dock in 11 years. We have sailed in three countries (US, Canada and Mexico – boy those are big countries) and have traveled to a fourth (Guatemala) by land. Our Spanish has improved drastically, though we still have a long way to go. We have been over budget almost every month, in part due to boat repairs, which are inevitable, even more inevitable than I’d anticipated, and in part due to some anxiety-induced over-preparation (“but this might be the last Home Depot we see for years! We should stock up while it’s available”, said without irony while cradling 9 rolls of duct tape in the 5th home depot we’ve visited in the last 4 towns). But we try not to allow money tether us to the boat and prohibit our adventures. We aren’t out here to sit on Halcyon in 76 different places; we’re out here to explore. We have money saved up specifically for this journey. And through a combination of boat deliveries, consulting work and resourcefulness, I am confident of our ability to make this dream work for as long as it is still our dream. Here’s one of my favorite statistics: in the last year, we have had 18 visitors and honorary crewmembers, including two repeat visits. We make the bed in the “guest room” (vee berth) often enough that our cruising friends have started calling us Hotel Halcyon. It gives me the warm fuzzies when I consider the love and support these visitors epitomize when they spend their hard earned money and time off to come share a bathroom with no shower in a tiny sweaty living space while we bob through the ocean together. Thank you, friends. Year one has been a magical, demanding, stressful, relaxing, tedious, exhilarating journey, and (I might as well close with a cliché) I can’t wait for what year two has in store. This is the article that appeared in 48 North in August 2017. I am absolutely giddy when your posts arrive and you never fail to inform, entertain, and inspire me. Happy year #1 and I, too, can hardly wait to see what year #2 brings! What a year you all have had ! Congratulations and thanks for sharing with all of us! Becca and John — Happy cruising anniversary #1! Your journey continues to inspire all of us living vicariously through your blog. Let us know when (if) you visit Seattle.